There's no need to make a trip to the store to buy an overpriced jar of onion salt. It's easy to make your own at home or find a quick substitute. There's probably a solution right there in your pantry that will save time and money. Onion salt is extremely simple, and there is no real secret. It is entirely just onion powder and salt. If you have those two ingredients, you're set and can make as much or as little as you need. Mix three parts salt and one part onion powder to make your own onion salt. Store it in an air-tight container until you need it. This recipe does not contain any anti-caking agents, so you may find that you need to stir your onion salt up before each use. No onion powder? If you have a bottle of onion flakes in your pantry, you can use it to make onion salt. Merely pulse some onion flakes in a coffee or spice grinder or use your food processor, until they're finely ground. You can then use the onion powder that you just created to make a batch of onion salt. It is best to use a dedicated grinder for all of your spices. If you use the same one to grind coffee beans and spices, your coffee may start to taste like things it shouldn't. If you grow your own onions or have a lot of onions on hand, consider making your own onion salt from scratch. 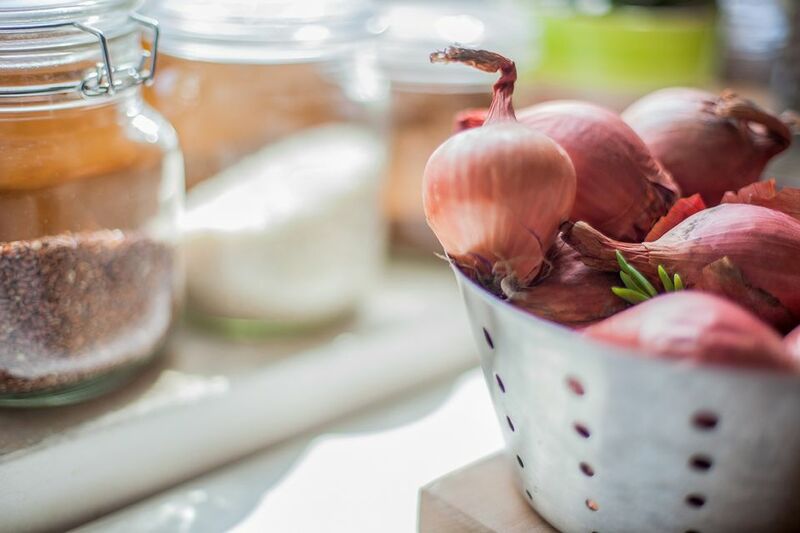 It's a fun and easy way to preserve onions. All you need to do is cut thin slices of a few onions and use a food dehydrator or your oven to dry them out. You can then use a grinder to turn your dried onions into onion powder and proceed with the onion salt recipe as usual. If you have fresh onions, and you don't mind adding their texture to your dish, you have the perfect substitute. Every half cup of finely chopped onions can replace each teaspoon of onion salt. This substitution does lack the salt, so consider adding 3/4 teaspoon of regular salt for each teaspoon of onion salt that the recipe calls for. If you're watching your salt intake, you may want to leave it out altogether. Not only does homemade onion salt cost far less than store-bought options, but it also comes with other benefits. One of the best reasons to make your own is that you get to control the amount and type of salt that goes into it. Feel free to tweak the ratio to include more onion and less salt. You'll have a lower-sodium product than you can buy at the store. You can also use kosher, sea, iodized, or non-iodized salt. Whatever your preference, your onion salt is sure to turn out great. Many commercially produced onion salts contain anti-caking ingredients, such as sodium aluminate. If you're trying to eliminate your exposure to these, making your own onion salt is an excellent way to go. Once you switch to homemade onion salt, you may find yourself using it more because it tastes so much better. It can even be used instead of your table salt. That would indeed be an easy way to cut your sodium intake by 25 percent.